Perpetual Plaques are a great addition to any awards program. A perpetual plaque can be configured for almost any purpose. Let us design your perpetual plaque today! 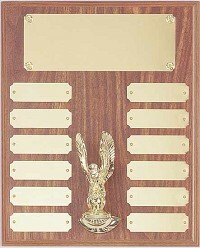 Perpetual plaques are a great way to accent your awards program. Our perpetual plaques can be engraved or imprinted with monthly, yearly, or quarterly information. Your employees will be honored to have their names appear on a beautiful perpetual plaque which recognizes their achievements. Custom designs and layouts are available to suit your needs. Call us today for options and ideas! Your nationally recognized perpetual plaque experts!